Tim Dunn and Nate Coppard are on a mission to rewire your brain. They're respectively the senior producer and senior designer behind Guitar Hero Live's new six-button guitar, and while neurological change is not their direct goal, it's a side effect they seem to relish. The new guitar has two rows of three buttons each, stacked on top of each other at the end of the neck -- this not only adds an extra button to the series, but it allows for fresh challenges. "It's not something people will be familiar with," Dunn says, glancing down at the Guitar Hero Live guitar in his hands. He taps some of the buttons. "It's a new thing." Seated next to Dunn, Coopard adds, "We've had a lot of people saying they can feel their brains kind of adjusting and kind of rewiring to the new way of playing it as they play through the songs, and then gradually getting to grips with how the difficulty ramps up as you jump around between the two layers." 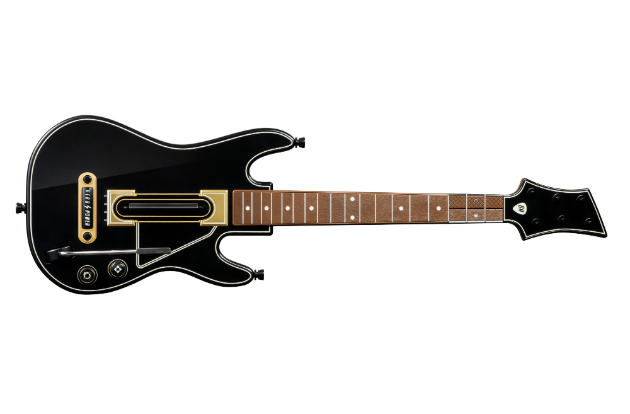 Guitar Hero Live's new guitar isn't licensed and wasn't inspired by any real-life model; it's simply the Guitar Hero Live guitar. It's sleeker than the original designs, black and tan with white trim and a faux-wood neck. There are no "candy-colored buttons" like on previous Guitar Hero controllers. Instead, the far end of the neck has a row of white-edged buttons directly below a row of black-edged buttons, their surfaces blending into the traditional design almost seamlessly. 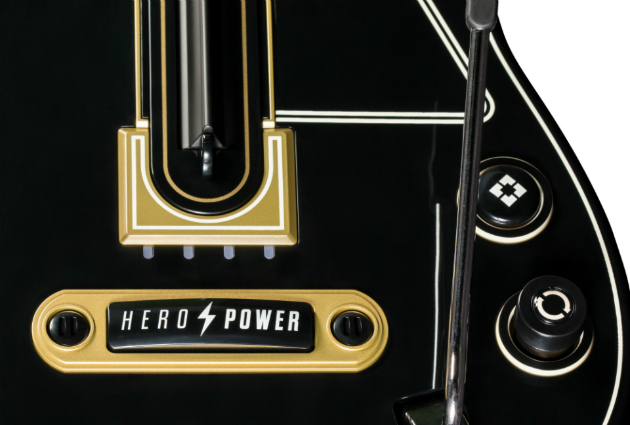 On the guitar's body, there's a long Hero Power button at the base of the strings, serving as an update to the game's previous "Star Power" bonus-points system, plus a whammy bar and a menu button. That last one is primarily used in Guitar Hero TV, a new mode for the series featuring a stream of playable music videos. A menu button may not be the sexiest aspect of the new guitar, but it's an important part of the redesign, Coppard says: "I guess you can get the fact of how fundamental it is to the game by the fact that it's influenced the design of the controller and it has an easy-access button." These are some of the changes to the guitar, but the similarities to previous editions are just as important to Dunn and Coppard: The new design needs to feel fresh to veteran players, but still familiar. The space between the buttons and the classic strumming bar is the same, Dunn says. Plus, the spacing between the buttons themselves is the same as in the old controllers. We noted a few other things that felt familiar when we tried out Guitar Hero Live in April, including the weight and shape of the guitar. "We didn't want to change anything that we weren't improving," Dunn says. Basically: If it isn't broken, don't fix it. "We didn't want players who were experts at the old Guitar Hero games, we didn't want them to just pick up Guitar Hero Live and just be brilliant at it straight-away," Dunn adds. "We needed to supply veteran players with a new challenge, so as you step up through the difficulty levels, by layering in both rows of buttons, the complexity really ramps up and can give a real challenge even to people who've mastered the old Guitar Hero games." Another similarity to previous Guitar Hero controllers is the power source -- the new guitars run on two AA batteries -- and the latency. Meaning, there is no latency, Dunn promises. "Only once did we ever really get a version that we felt had that latency and really wasn't quite what we were looking for, and that was just a matter of tuning some new components in the guitar. Honestly, I don't think we've ever really had issues where we thought, 'Well, this is something we need to improve upon.'" Plus, Coppard and Nate say the new guitar plays the same across Xbox One, PlayStation 4 and Wii U. It's the same guitar, just a different wireless dongle for each platform. "We want everyone to get the same experience, regardless of the platform they're playing on," Coppard says. Since Guitar Hero Live's reveal in April, Dunn says there's been one surprising reaction from fans: Players wondering if the game is going to be hard enough. "The fact that people picked up on that as a concern, I kind of felt was weird," Dunn says. They added an extra button, after all, so the game should be harder from the get-go. However, Coppard adds, "There was a small selection of people that didn't notice there was actually six buttons." Overall, the Guitar Hero Live design team has a clear vision for the new game and the new guitar: "We want it to feel authentic," Dunn says. The backgrounds in Guitar Hero Live are real crowds that react to how well each player performs, as if it's all a big music festival -- and for anyone wondering, players won't be able to turn these backgrounds off. "To us, it wouldn't make sense to turn that off any more than it would be to turn off the notes coming down," Dunn says. "It is only really when you step up, you plug it in and you start playing along to the music that you really get a groove for what we've done and why we've done it differently," he adds. "Hopefully that's when people really start to understand the extra layer of fun that's added in with the button layout."